While the current worldwide economic woes have created a decided downturn in the digital printing market, Lyra believes the global digital printing market will expand through 2012. Lyra currently projects a compound annual growth rate (CAGR) of 3.7 percent for a combination of ink jet and laser consumables between 2007 and 2012. Lyra Research's Hard Copy Supplies Advisory Service has just released a report--Economy Hits the Ink Jet Supplies Market--that examines how the current economic factors are impacting the ink jet market and how the anticipated digital printing market growth will be achieved. While the current worldwide economic woes have created a decided downturn in the digital printing market, Lyra believes the global digital printing market will expand through 2012. Lyra currently projects a compound annual growth rate (CAGR) of 3.7 percent for a combination of ink jet and laser consumables between 2007 and 2012. Lyra Research's Hard Copy Supplies Advisory Service (SAS) (http://www.lyra.com/lh3m.nsf/AdvisoryServices/SAS) has just released a report--Economy Hits the Ink Jet Supplies Market--that examines how the current economic factors are impacting the ink jet market and how the anticipated digital printing market growth will be achieved. Specifically, the report discusses the effect the economic crisis has had on the installed base of ink jet hardware, desktop ink jet cartridges (OEM and aftermarket), ink jet media, and bulk ink. It also examines how higher prices for OEM ink jet cartridges could impact sales of aftermarket ink jet cartridges. 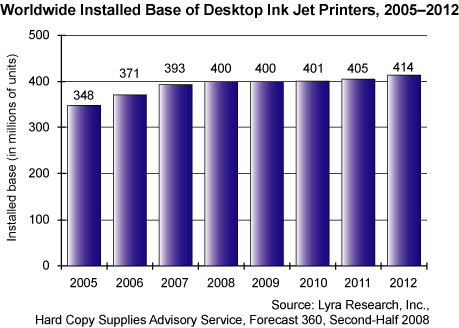 Bulk ink sales and media sales are also forecast through 2012, including an explanation of which factors influence Lyra's forecasts. One of the interesting facets of the current economic crisis is that the growth of the digital printing market has been curtailed in both developed and developing regions. Printer manufacturers and analysts once predicted that the highly populous nations of China and India would be a boon for the hard copy industry. However, manufacturers' hardware sales have slowed significantly in these countries over the past year. The markets of all the emerging regions remain relatively small compared to the major markets. Overall, Lyra forecasts that the highest regional increase in ink jet and laser consumables will come from Europe, the Middle East, and Africa (EMEA). To learn more about what ink jet hardware and supplies manufacturers are facing and to purchase the Economy Hits the Ink Jet Supplies Market, go to http://lyra.ecnext.com/coms2/summary_0290-1004_ITM. Commenting on the outlook for the industry, Andrew Lippman, senior analyst for Lyra's Hard Copy Supplies Advisory Service, says, "It is quite clear that the digital printing industry is experiencing the worst economic recession in its history and most OEMs have a dismal outlook for 2009. One of the driving forces behind this doom-and-gloom attitude is the fact that these manufacturers rely heavily on the mature ink jet supplies market. However, there is good news. Ink jet technology continues to improve and manufacturers are exploring new opportunities in new markets. The one thing that the industry cannot do is stand still, and it is certainly not doing so." The Economy Hits the Ink Jet Supplies Market report is available for immediate purchase at a cost of $595. For more information, contact Sandy Tobin, client relations manager, at 617-454-2612 or stobin (at) lyra (dot) com, or visit our online store at http://lyra.ecnext.com/coms2/summary_0290-1004_ITM. Sign up now for Lyra's Research Briefs--Hard Copy, Marking Supplies, Media Supplies, Consumer Imaging, Europe, and China--which feature forecast information and primary research data. The research briefs are sent out approximately every quarter. In addition, special bulletins are distributed that contain information regarding Webcasts and events related to each of the topics in the briefs. To update your profile and add your name to the mailing list, click here http://visitor.constantcontact.com/d.jsp?m=1101693414919&p=oi and enter your e-mail address. Instructions will be e-mailed to you that explain how to join the appropriate list. Selling cartridges, ink, toner, and media to an ever-increasing number of end users demands a keen understanding of various user environments--corporate, commercial, small office/home office, and home--each of which requires different marketing, packaging, and distribution channels. Lyra Research's Hard Copy Supplies Advisory Service (SAS), a high-level, online strategic and tactical planning resource, provides the advice that vendors need in order to thrive. The SAS allows clients to augment their product development, competitive intelligence, and marketing functions without the addition of costly staff. The SAS consists of six components: ongoing expert consultation, shipment and revenue forecasts, primary market research studies, analysis reports, industry news and updates, and an annual briefing. In addition, Lyra's online content delivery features a continuous flow of market data, analysis, and insight, providing a top-to-bottom depiction of events and trends in the imaging supplies industry.